01. Soften dry or cracked elbows suffering from winter’s lack of moisture. 02. Struggle with your nail polish bottles? Put a little Vaseline under the cap and make your next mani/pedi a breeze! 03. Never get lipstick on your teeth again! Put a little Vaseline on your teeth and keep them pearly white. This is a technique often used by beauty contestants. 04. To prevent streaks if you are heading out for a spray tan, rub on the backs of ankles, knees and hands to stop those tan lines. Keep that glow going during winter months! 05. Make those eyelashes grow! Put a little Vaseline on your lashes at night, and watch them lengthen – no prescription necessary. 06. Maintain your perfume scent: if you rub a little Vaseline on your wrists and neck, it’ll help your perfume stick around. 07. Beat split ends between trims: rub a dab of Vaseline between your fingers, then touch up your ends. Be careful not to use too much! 08. Have a big interview tomorrow? 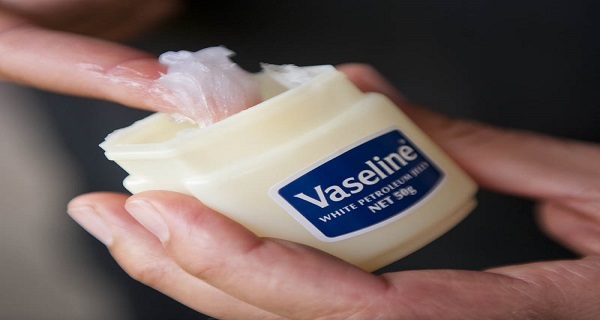 Use some Vaseline to touch up your scuffed boots or heels, making them look good as new! 09. Prevent those embarrassing hair dye stains on your forehead: Softly dab all over your hairline and keep that box hair dye from dying your skin the color of your new ‘do.